I must say that I enjoy walking, be it in big cities, small towns, or ‘off’ road. I get totally absorbed by everything around me, and very rarely do I have to deal with other people – if I don’t want to. Well, I’m a man and I never really knew that for women this isn’t the case. 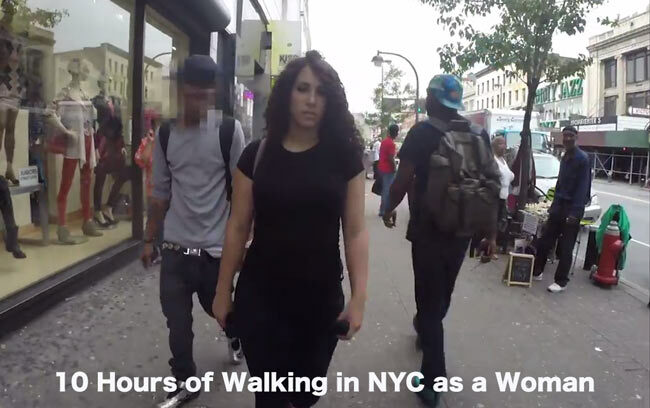 I was quite shocked when my wife told me that this what you are going to see in the following video is totally ‘normal’ for a woman who’s doing something very insignificant like walking down a street in New York City. Of course I knew that women have to go through much more harassment than men (obviously), but the magnitude is just astonishing. When I look at it I ask myself: What is this? A frickin’ jungle? The monkey age? Women without male company seem to be perceived as a potential prey by a number of short-brained monkey-humans who were mistakenly born into a male human body. Well, karma never sleeps and will – of course – make sure to look after those guys. And when adding the possibility of reincarnation, then it might happen that they get born again, but next time – as a woman. Good luck guys.